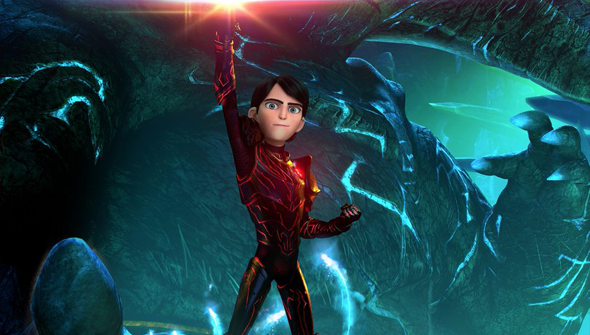 Guillermo del Toro's debut animated series Trollhunters got off to quite the start, it's fair to say. Since arriving on Netflix late last year, it has built up a following among fans of all ages, and word is that it's Netflix's most successful kid's original to date. Now, with the series having recently won three Annie Awards, word reaches us on the show's future. As confirmed by GDT himself on Twitter "Season 2.. is confirmed!" The news keeps getting better too, as more than one more batch of episodes is on the way. If you're familiar with the way other DreamWorks animated originals have been released on Netflix, (for example Voltron) you'll be aware that episodes are generally released in half seasons. That means that the recently released episodes (labelled as "Part one") only make up half of the first full season (26 episodes). Which means that next up we will see a 13 episode "part two" making up the rest of Season 1. Season 2 will be another 26 episodes, that will presumably also be split into two parts- three and four. As the creator explained in a follow-up tweet,"We have 52 episodes mapped for TROLLHUNTERS. We delivered 26 (two 13 episode seasons) in what we called Season 1. More to come!" This also suggests that the show has a planned ending- although based on the show's huge success, it wouldn't be a big surprise to see it continue beyond the original 52 episode order in some form or another. Even better is the news that this plan allows the late Anton Yelchin's work on the series to be preserved. Because all 52 episodes were planned out and storyboarded well in advance, the actor had recorded all his parts before his tragic passing last year. No release date has been announced for Trollhunters "part two" (or beyond) at this time.